My son's been enjoying early phonics for summer camp these past two weeks, so to reinforce, I've pulled out all the letter books we haven't bothered with since he was younger. I must say, I've thoroughly enjoying seeing my old friend Kate again. Her drawings hold so many memories as my mother spoiled my sisters and me with her books in hopes that we would idealize her perfectly-bonneted girls and abundant 18th century English gardens. Who wouldn't, really? 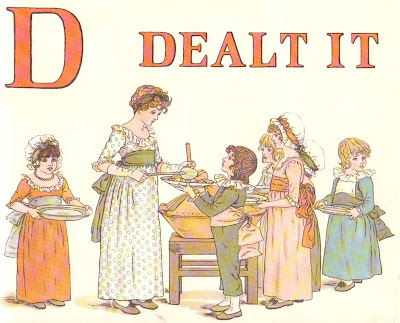 In this particular title, we see the alphabet framed against the drama of an apple pie. A myriad of colorfully-dressed children do everything from cut it to bite it to fight over it to (strangely enough) mourn for it. An interesting peek into early phonetic representation. Revered more for the clothing she drew on her characters that for the actual drawings themselves, I find it fascinating that a woman back then could reach her level of fame and fortune on her own two feet. I'd love to know more of her history. She must've lived quite a life. For anyone who loves Victorian style, her drawings are quintessential, and I remember always having a few greeting cards bearing her images hanging around for the random thank you note or birthday card. Lovely, lovely. Click here to see the non-library binding cover and full page spreads. One of my favorites. Thanks for featuring it on your blog. 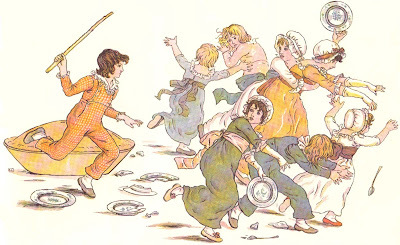 Kate Greenaway did wonderful illustrations. Lovely, lovely, lovely. You can always spot her style. What a gorgeous way to learn the alphabet! One of my absolute favorites! Loved it as a child, but mostly forgot about it. 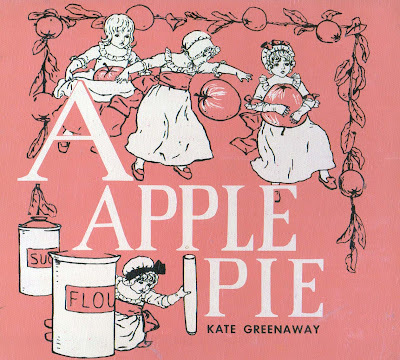 Then I rediscovered it in a Kate Greenaway collection earlier this year. And in a bizarre coincidence I received a beautiful used copy as a gift from a friend. She was completely unaware that I loved this book so much and only knew that I had an alphabet book obsession. I treasure it!